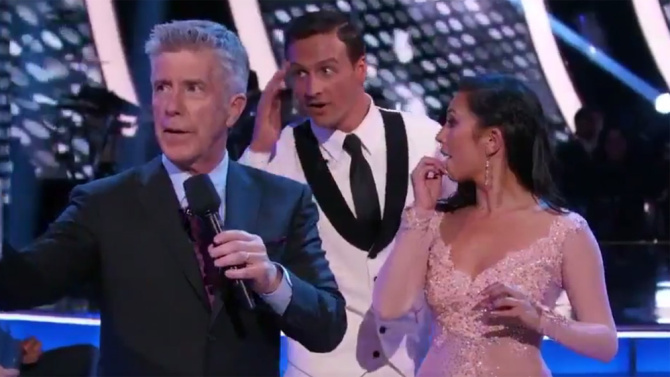 HOLLYWOOD – Ryan Lochte has given his version of events after Dancing in the Stars – on which he was guesting – was disrupted by protesters. It was unbelievable. We’d done our routine and I thought we’d done really well. I was listening to the judges give me their feedback and obviously I was a bit nervous. Tom Bergeron was standing by me when I heard the sound of a helicopter. I guess the protestors must have used it to get on the roof of the studio and then they roped in from above. They were both firing flamethrowers and I was really concerned someone was going to get hurt. My first thought was to protect other people. So I threw myself in front of the security. My thinking was, why should the security guys get hurt because of me? So when I saw the grenade on the floor, I didn’t think twice I threw myself on it and tensed my abdomen against the blast. The grenade might have killed a normal man but my abs are really hard. Then I used my nunchuks and martial arts skill to disarm the men. I repeated my mantra as I was doing it to help me keep focused and even when they sprayed the audience with machine gun fire I did my best to restrain the men without harming them. Dancing with the Stars features Kim Jong-il and Amanda Knox next week.